It is with the same level of success that The world tattoo event will open its doors once more in Paris. 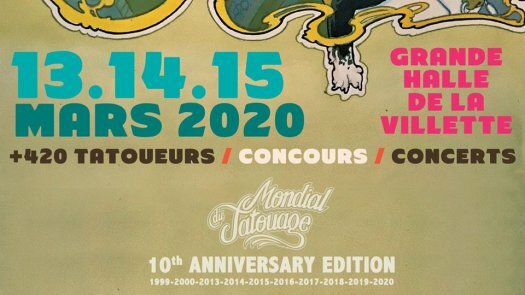 The most important tattoo convention in France is getting ready again. The world tattoo show will take place at the Grande Halle de la Villette. The world tattoo show features more than three hundred tattoo artists from the four corners of the world. Rising stars of tattoos and famous international tattoo artists will be presenting their artwork, "flash tattoo", books, prints, etc. The convention is also an occasion to get tattoo-ed by a tattoo artist – or female tattoo artist – from anywhere in France or abroad. Tattoo competitions will be organized during these three days, concerts, DJ sets, tattoo-art-exhibitions, as well as guests of honor. Three days of pure joy for the eyes and why not offer yourself a tattoo! It is essential to make an appointment with the tattoo artist (addresses of tattoo artists are on the website of the World tattoo show) to book for a time slot prior to the show. Or else try your good luck onsite and maybe you can benefit from a no-show or a free time slot. Many stands are available. Besides the tattoo stands, you will find professional materials to make tattoo: ink, tattoo machine, hygienic products, etc. Various boutiques propose books about tattoo art and goodies: t-shirts, jewelries, piercing, etc. Take a look on our list of hotels near Grande Halle de la Villette. Another option is to book your hotel room near the metro line 5 or close to Gare du Nord as line 5 link the station too, you can also opt for hotels at Bobigny to book cheaper rates than in Paris as the station Pablo Picasso Bobigny station is also on line 5. Want to take a break? Book a hotel at Paris close to the Orlybus line at Denfert-Rochereau or in the center of Paris at Châtelet-les-Halles. There are some food trucks around the venue which propose some French delights, sweets and snacks for a light meal. Road : Périphérie, sortie porte de Pantin.